Dressers and tabletops often double as media-centers or storage overflow, and quickly become messy and disorganized. Decorative tables easily become drop spots for DVD cases or extra remotes. Extra clutter is an easy way to lose control of a peaceful and enjoyable space. Bedroom and recreational spaces benefit greatly from custom wall units designed and installed by The Custom Closet Company. A customized wall unit is an exceptional way to organize any room in your home. Does your bedroom have unused and wasted space resulting in a disorganized mess? Do you wish your tabletop was free of cords and media clutter? Call the Custom Closet Company and we will solve all of your wall-unit organizational needs. 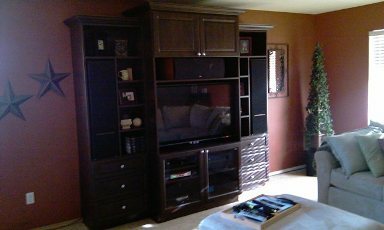 The Custom Closet Company will be happy to design and install a custom bedroom wall unit to clear up your media clutter. Our team will identify the problems and needs of your current bedroom media organization, then we craft and install well-designed solutions for you. Call today (253) 245-3883 and The Custom Closet Company will set up your appointment for a free in-home estimate. Don't wait to enjoy the organization! The Custom Closet Company serves the Greater Puget Sound area including Pierce and King counties, call today and let's us help you get organized.